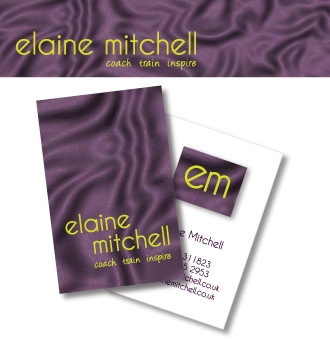 Offering corporate and individual coaching and training services, Elaine Mitchell needed distinctive branding for her stationery and website. She wanted a contemporary look combined with a 'folded fabric' effect. I created the image using Photoshop techniques, and combined this with a crisp but slightly unusual sans serif font, which I then applied to her business cards, letterheads and web banner. 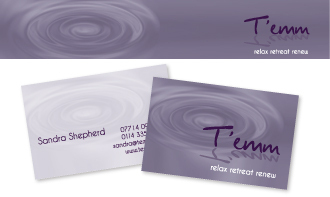 Elaine was so pleased with this branding, she commissioned me to design the branding for her second business, T'emm, which she runs with her sister Sandra Shepherd. Providing healing therapies and treatments, the ladies were after a design which would blend well with Elaine's orignal designs, but which would suggest the calming atmosphere their treatments deliver. Again, I created this 'pond ripple' effect in Photoshop. I combined the artwork this time with a 'hand-drawn' look for the main typeface with a subtle reflection, suggesting a more relaxed feel, but again made use of the sans serif font from Elaine's initial branding for the T'emm strapline to give a consistency to the whole suite of branded material. I've used this imagery to create business stationery, promotional leaflets, display banners, vehicle livery and web graphics for their business. "I've just received my business cards and stationery - I am more than pleased with the results! The products look fabulous and were delivered in no time at all! Working with you is a pleasure - you understood my requirements, I was most impressed with your professionalism and the speed of work carried out. From first meeting to final draft, it was just a matter of days, and my stationery pack was delivered within a week. I highly recommend The Smart Station and wish you nothing but success in the future!"